Today I’ve got somewhat of a different post for you. We all love saving money and we all love our smartphones—why not combine these two loves for something super useful? 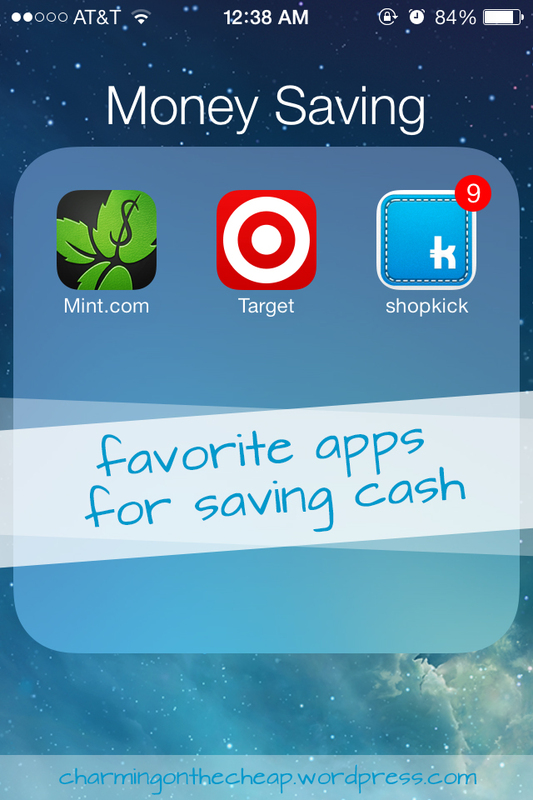 I’m all about helping you save some money, so today, I’ve got my three favorite apps for saving cash! Mint is a super useful personal budgeting tool. You can use it online, as an app on your computer, or even use it mobile on your iPad or iPhone (and Android devices, but I’m an Apple girl through and through). Mint lets you enter all your bank accounts and credit cards (it’s completely secure!) and tracks your purchases from each account. You can set an overall monthly budget, as well as budgets for any category you want, whether it’s shopping, school supplies, groceries, or fast food. Mint uses handy charts and graphs to help you visualize your incoming and outgoing money and really helps me stay on track. Target’s app is great if you’re at all like me and do all of your shopping there. I go to Target at least once a week, always with a new list of things I need to buy. The Target app lets you keep track of these shopping lists. The list feature is still in beta testing, but I really enjoy it. The weekly ads are published on the app, so you know what’s on sale before you enter the store. There are even mobile deals & coupons that you pull up and simply have the cashier scan. ShopKick is a really neat app that utilizes the GPS and camera features on your smartphone and rewards you with kicks, or points that accumulate and go toward a gift card to the store or outlet of your choice. You simply open the app before you enter a store and it checks you in and rewards you with kicks, ranging between 35 and 150 (so you have a better idea, 1250 kicks equal a $5 gift card). I use my weekly shopping trips to Target and other stores toward my Target gift cards, helping me save money down the line. You also have the option to scan the barcode on specific items throughout the store to earn more kicks, as well as unlock coupons. Do you use some other apps to save money and stay on track? Friday Favorites: DIY Holiday Gifts! TotesAwk - Let's blog about it! Own Your Look. Own Your Life. "I am a Princess because my Father is the King of kings"
A "How-To" for college students wishing to make the most out of their experiences on campus!